Only 24 models will be made exclusively for Europe. The new Bentley Continental is just around the corner, but the Crewe-based automaker isn’t sending the current model into retirement just yet. To celebrate its return to the Nurburgring 24-hours race for the third consecutive year, Bentley has lifted the wraps off a surprise new special edition model called the Continental 24. Based on the range-topping, Bugatti Veyron-beating Supersports, only 24 units will be produced as the name suggests, all of which will be sold exclusively in Europe. Distinguishing the Continental 24 is a unique two-tone paint combination of Monaco Yellow and Black Crystal that matches the Bentley GT3 race car that will be competing in this year’s gruelling Nurburgring 24-hours race. Alternatively, customers can opt for the equally striking James’ Red and Black Crystal color combination, or a single-tone option is available at no extra cost. Yellow or red accents can be applied to the 21-inch black lightweight forged wheels to match the race-inspired paintwork accordingly. Elsewhere, carbon-fiber door mirrors, black brake calipers, and black body accents complete the exterior enhancements. The racing theme continues inside, as the cabin is adorned with an abundance of carbon fiber components, including fascias, door panels and individually-numbered treadplates. The sumptuous Alcantara seats are wrapped in diamond-quilting, and a special “Continental 24” emblem is embedded into the headrests. 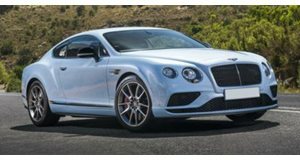 Since the Continental 24 is based on the sensational Supersports, you get the same W12 6.0-liter engine twin-turbo engine that develops a monstrous 700 horsepower and 750 lb-ft of torque. 0-62 mph takes just 3.5 seconds before maxing out at 209 mph - no mean feat for a car weighing 6,063 pounds. Prices start at 250,000 Euros (around $280,000), with deliveries set to start in July.